Item # 310561 Stash Points: 995 (?) This is the number of points you get in The Zumiez Stash for purchasing this item. Stash points are redeemable for exclusive rewards only available to Zumiez Stash members. To redeem your points check out the rewards catalog on thestash.zumiez.com. 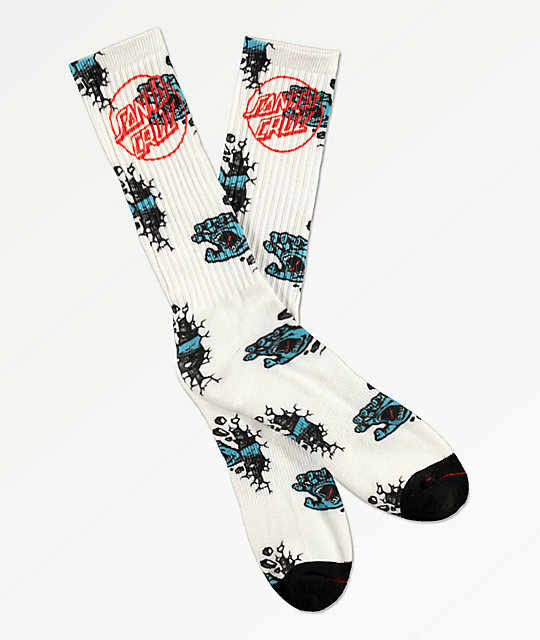 Your feet will scream for joy with the Wall Hand white crew sock from Santa Cruz. Adorned with jacquard knit screaming hands bursting through walls throughout, these socks are finished off with an Opus Dot Santa Cruz logo on the upper and contrast toe and arch support ribbing. Wall Hand White Crew Socks from Santa Cruz. Jacquard knit logo throughout in blue, grey and red. Wash in warm water, tumble dry normal.